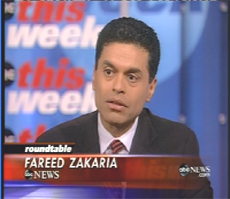 Fareed Zakaria took exception with St. McCain's call for more troops in Iraq on THIS WEEK. STEPHANOPOULOS: Even if we had more troops it wouldn’t work? ZAKARIA: There is no question that if you had more troops and you still can’t go after the militias, can’t offer amnesty to the Sunni insurgents. The core political decisions we have to make do not depend on more troops. They depend on political compromises that this government, this ruling coalition can’t make. Sending more troops and in that context is, is just willing more American deaths. Update: Kevin Drum wonders why Fareed just won't tell us to leave Iraq. "Apparently the straitjacket of maintaining membership in the community of serious mainstream analysts is a powerful one"